Long Beach is a popular beach town and vacation destination for many Pacific Northwesterners and big city dwellers like Seattlites. There is just one main road, and a long one at that, Pacific Avenue which hosts a number of souvenir shops, diners and restaurants, hotels and museums, and a landmark sculpture or two. On this long stretch of land are two historic lighthouses, oyster farms and cranberry bogs. Long Beach is on a secluded peninsula with just a small bit of land allowing visitors to enter and exit. But one great delight of mine and hopefully yours, if not now in the future, is driving on the beach. I'm not saying it's the healthiest for our beaches and oceans but it sure is an experience worth having. I grew up driving on the beaches of Ormond, Daytona and New Smryna. Car top down (a Jeep is the best beach driving vehicle), windows open, beach breeze blowing through, elbows propped on car door, and music playing are the ingredients for good beach cruising. A great way to people watch or to meet up with friends on the beach. This is a popular beach for flying kites all year long. But the for serious kite lovers there is the Washington State International Kite Festival. A can't miss celebration for a solid week every August. There are kites of all kinds like fish, shrimp and octopus, cats and frogs, twisters and spinners as well as high performing kite acrobatics. The brilliant colors fill the sky over Long Beach Washington for a fantastic week. Long Beach also holds a yearly sand castle festival in the summer. All ages can participate but the highlight of the weekend are the masters of sand sculpting. The main street is lined with souvenir shops and restaurants and lots of traffic during the summer months. 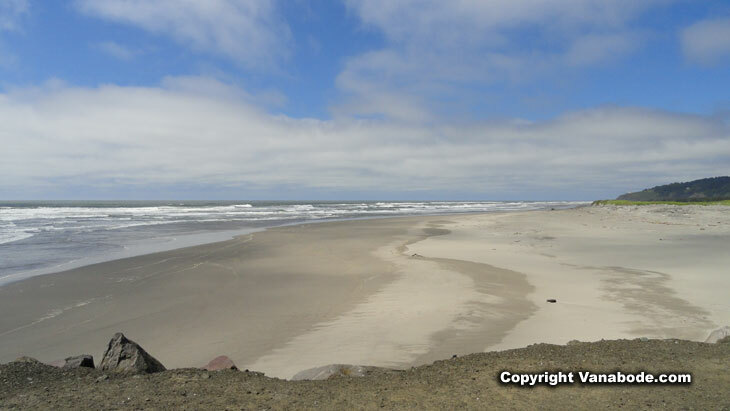 But their are places for seclusion along the peninsula such as Cape Disappointment. And there are places with history like the Lewis and Clark Interpretive Center and World War II remnants. Above: Picture the expansive Long Beach. There is plenty of room on this beach for driving, laying out, walking, building sand castles and flying kites. Minute by minute the sky is forever changing with fog and clouds letting the blue sky peak through now and then. It makes for an unforgettable coastal experience. As soon as you enter the peninsula on US 101 the cranberry museum and bog is close by. The museum is free and the cranberry bogs are out back. You can check out the harvest machinery and learn how bogs work through the self guided walking tour. The cranberries are only harvested once a year so you have to carefully plan your visit if this is an activity you are interested in seeing first hand. Harvesting cranberries is actually a big deal here. I mean, really, after seeing dad and son in the wet cranberry bog who wouldn't want to see how the tart crimson red fruit is harvested. 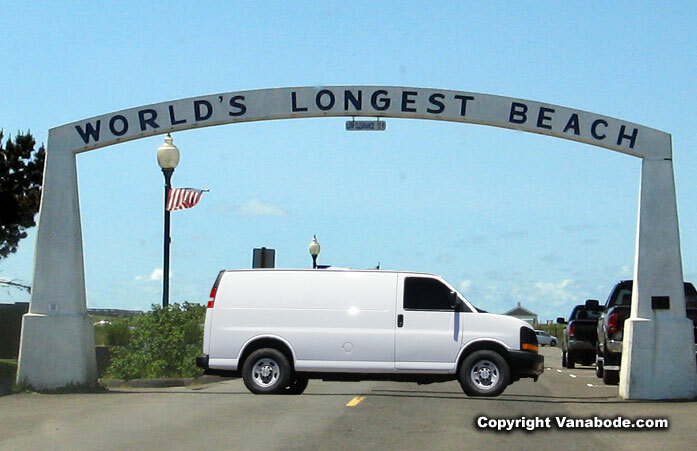 Above: Picture of Long Beach's arch gateway leading to the Pacific is labeled "World's Longest Beach." The beach is a state park and is 28 miles in length and the reason for this bold statement. It is also known as the Worlds Longest Drivable Beach. However, at various times of the year driving on the beach is prohibited. California's southern most beach, Imperial Beach, has a very colorful and retro arch. The very popular Long Beach Boardwalk is a short half mile but well worth the walk and not just looking at it from the beach. You can catch some awesome views from it, have a snack and read the strategically placed interpretive displays for little effort. There are public restrooms at each end of the boardwalk too. The Discovery Trail crosses under the boardwalk at one point. This trail is dedicated to the Lewis and Clark expedition and stretches a little more than 8 miles from Ilwaco to North Long Beach. Along the paved trail you will come across some stopping points for pictures and to glean some history. There is a large skeleton of a Gray Whale that washed ashore a few years back, and bronze sculptures of Captain Clark with a sturgeon fish and another one of Clark's Tree. They all have fascinating stories behind them. 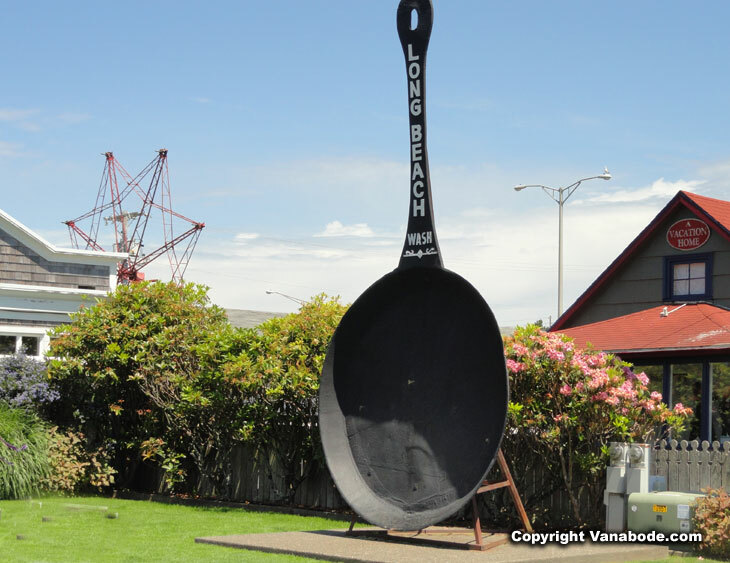 Above: Picture of the well known Long Beach frying pan. The chamber of commerce constructed the World's Largest Frying Pan in 1941. And since then it has been a wildly popular backdrop for photos. It measures 9 feet, 6 inches in diameter and at one time was used in the Peninsula Clam Festival. Above: Picture taken from jetty at Leadbetter State Park showing the separation from Willapa Bay and the Pacific Ocean. Leadbetter is at the northern tip of the Long Beach Peninsula. The dunes are constantly shifting and are alive supporting beach grass and flowers of the lupine, sand verbena, wild strawberry and beach pea. There have been recorded over 100 species of birds here. The Cape Disappointment lighthouse was the first on the peninsula. Ships bound for Portland and Astoria navigated their way through the high waves and shifting sandbars between Washington and Oregon since the 1840s. The Lewis and Clark Interpretive Center sits on a peak 200 feet over the mouth of the Columbia River. You can climb to the lighthouses and explore an old military fort. There are acres of coastal forest to hike through and a freshwater lake. If your lucky you might be able to see some deer walking through the tall grasses on the cliffs or just walking across the street. 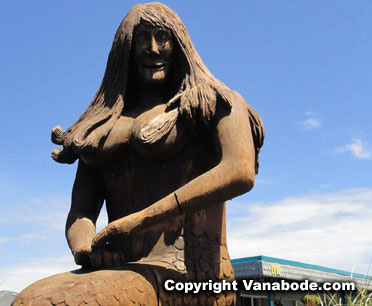 There is so much to do on in this area and that is why so many people vacation here in Long Beach Washington.